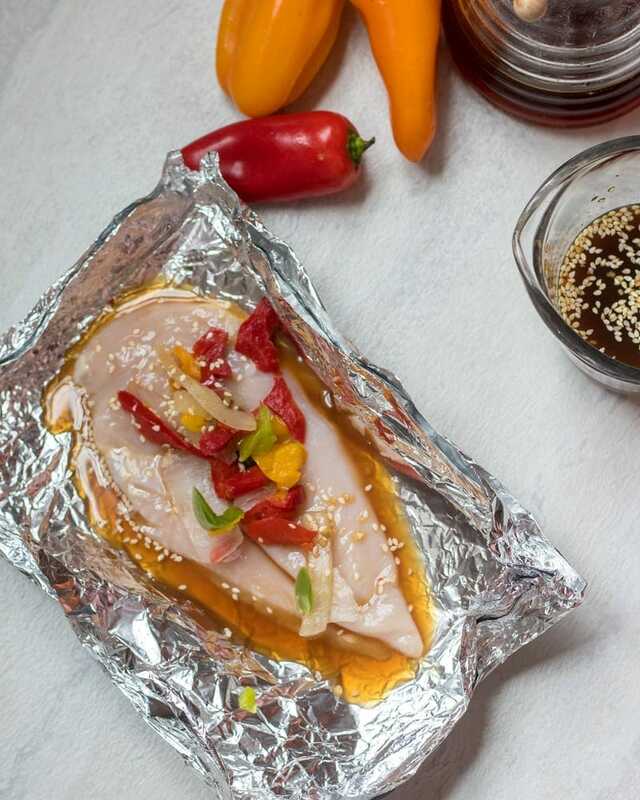 Grilled Teriyaki Chicken Foil Packets: Chicken is marinated in a homemade pineapple teriyaki sauce and then grilled up to perfection with sweet peppers in a foil packet for the easiest clean-up ever. I have a question for you…..do you like to grill year round or do you reserve it just for the summer months? Personally, I say I like to grill all year round, but truth be told, I rarely fire up the grill for things like Grilled Corn on the Cob, Grilled Berry Crisp and Grilled Jerk Chicken Kabobs, until the warmer weather hits. 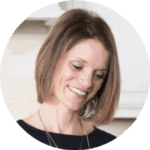 And then once summer hits, I say good-bye to my oven and resort to easy grilling, slow cooker, or Instant Pot meals to keep the heat OUT of my house. After a busy day, these grilled chicken packets make the perfect dinner. 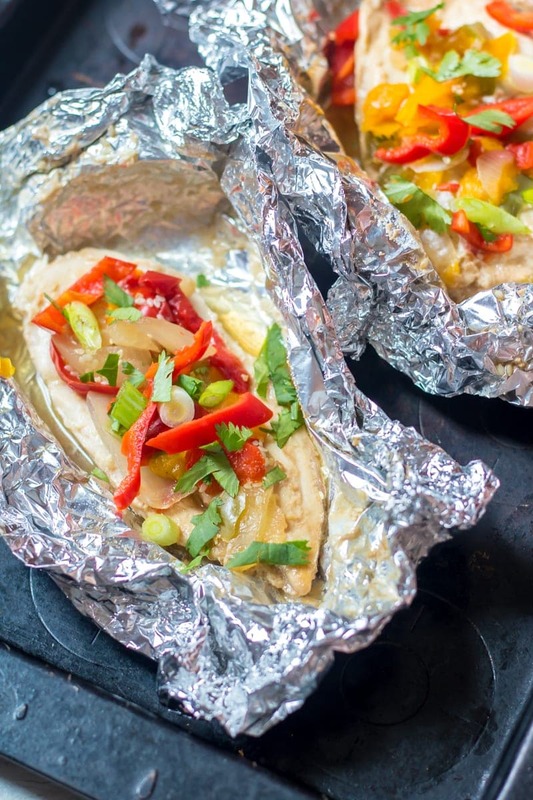 There is no clean up–toss the foil when done cooking. No need to heat house up on warm summer nights. It is a breeze to put together. And it still delivers a heavy wallop of flavor. Teriyaki is actually not a sauce but a Japanese cooking technique that means to grill meats with glaze of soy sauce and sugar. But what is referred to as Teriyaki Sauce is a sauce made up of soy sauce, a sugar of some sort, and mirin, and some recipes include ginger. My homemade Teriyaki sauce is made with all those key ingredients, but there is an ingredient in my Teriyaki Sauce that may surprise you…..PINEAPPLE JUICE! Pineapple juice is my secret weapon in the perfect Instant Pot Chicken Breast recipe, Whole Wheat Zucchini Bread. Pineapple juice is naturally sweet and pairs perfectly with the soy and ginger I use in my teriyaki sauce, and allows me to cut back on the amount of sweetener I use in my Teriyaki Sauce. To make homemade teriyaki sauce, mix together pineapple juice, honey, freshly grated ginger, and mirin. Mirin is a Japanese cooking rice wine and is easily found at supermarkets. I also like to add some sesame seeds, but that is totally optional. How Long should you marinade Chicken Breasts in Teriyaki Sauce? You can marinade your chicken breasts up to 24 hours in the Teriyaki sauce prior to grilling. Marinade chicken by placing in heavy duty freezer bag or shallow container and pour marinade over chicken, turning chicken every couple hours. DO NOT marinade meat in foil packets, as foil will cause a chemical reaction to occur with your marinade. At this point, you can grill your chicken directly on your grill and skip the foil packets with the added peppers and onions. 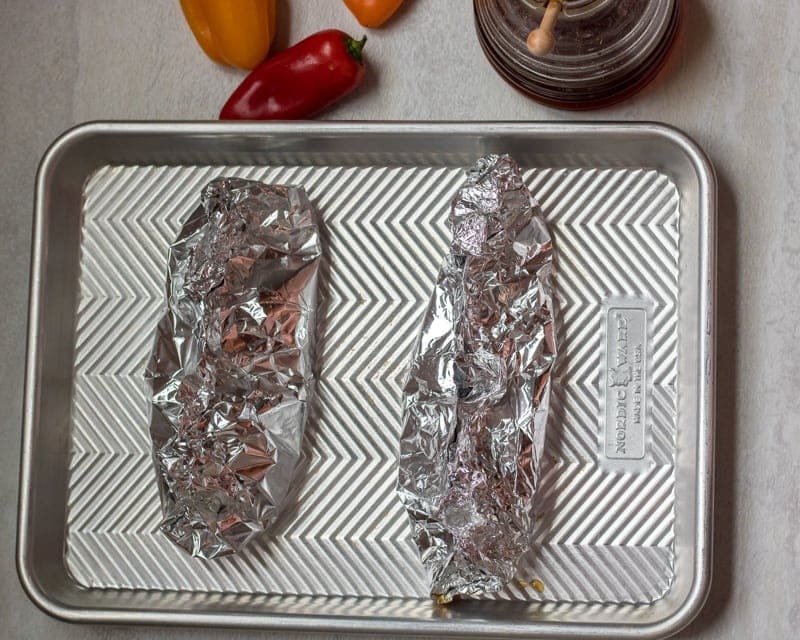 Grilling in foil packets is such a great way to prepare dinner and to keep your grill clean! Step Two: Place the prepared chicken breast on the center of the foil. Step Three: Top chicken breast with pepper and onion slices. Step Four: If you did NOT pre-marinade your chicken in the Teriyaki sauce, add 2 tablespoons of sauce to each foil packet. Step Five: Secure foil packet around chicken by bringing sides together and creating a seam at the top of the packet. Step Six: Grill on pre-heated grill until chicken has reached an internal temperature of 165 degrees. Can you bake Teriyaki Chicken Packets? Let’s say it starts to rain just as you are about fire up the grill, or the craving for teriyaki chicken strikes in the dead of winter and you are like me and don’t want to grill if it is cold. Then all you need to do, is BAKE these teriyaki chicken breasts. Bake the Teriyaki Chicken Foil Packs at 400 degrees for 15-20 minutes or until chicken has reached internal temperature of 165 degrees. You can use defrosted pepper and onion mix in place of fresh peppers and onions. This is a great cost effective tip! You do not need to flip your chicken foil packets over while grilling because you are really steaming the chicken in the foil. Plus flipping the chicken will potentially cause the marinade to leak out of the foil. Be sure to use FRESHLY grated ginger on a microplane for the homemade teriyaki sauce. If you do not have fresh ginger, omit it altogether, do NOT use powdered ginger. The sesame seeds are completely optional in the teriyaki marinade. Be sure to use tamari or gluten free soy sauce if you need this to be GLUTEN-FREE Teriyaki Chicken. You can use maple syrup in place of the honey for PALEO Teriyaki Chicken. Chicken breasts are marinated in a homemade pineapple teriyaki sauce and then grilled up to perfection with sweet peppers in foil packets for the grill for the easiest clean-up ever. At this point, you can add the chicken to the marinade for anywhere up to 24 hours. Combine the pineapple juice, honey, soy sauce, sesame seeds, sesame oil, mirin, and garlic in a shallow dish. Place each piece of chicken on piece of foil that is large enough to wrap up the entire piece of chicken and fold over the top. Place 1/4 of the pepper and onion mixture on each piece of chicken and pour about 2 tablespoons of marinade over the chicken. Bring all sides of the foil up together and fold together securely for each piece of chicken. 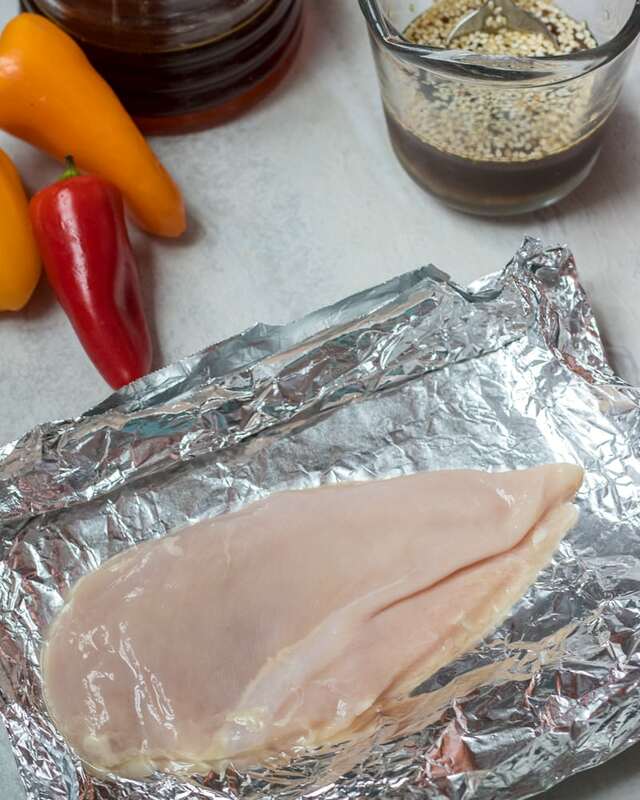 Place foil packets seam side up on grill and cook over medium heat for about 20 minutes, or until chicken reaches an internal temperature of 165 degrees. Allow to cool slightly. Open foil packet up carefully, as steam will escape. You can marinade chicken up to 24 hours in Teriyaki sauce prior to grilling. Marinade chicken by placing in heavy duty freezer bag or shallow container and pour marinade over chicken. DO NOT marinade meat in foil packets, as foil will cause a chemical reaction to occur with your marinade. I love quick, easy dinner ideas! And besides that, your teriyaki packets look delicious!!! Thanks!! Thanks Liz! 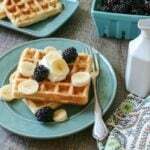 They do deliver super flavor with little effort…perfect for busy summer days!I hope you enjoy! 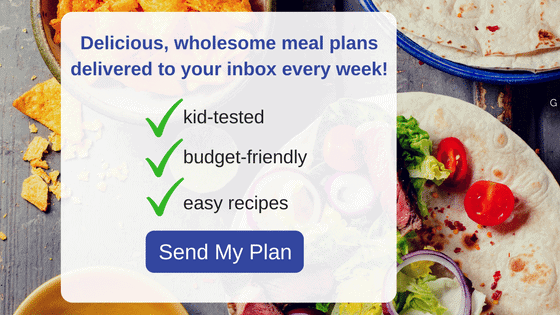 I can’t wait to try your Chicken Teriyaki Packet, fun and delicious! Your place at our table is very special and thanks so much for sharing your wonderful food with all of us at Full Plate Thursday. Hope you have a fantastic week and come back real soon! Thanks!! I am honored to share at Full Plate Thursday. Thank you for hosting the party. LOVE chicken teriyaki! I will have to try this! Thanks for the great recipe and for linking it up to Tasty Tuesdays at Creative K Kids. I pinned it to the Tasty Tuesdays Pinterest Board. Thanks for pinning. If you’ve teriyaki you will love this…especially since it could not be any easier! !